Meeting of scientists and teachers of NTU "KPI" with the delegation of University College of Gjøvik (Kingdom of Norway) took place at March 18, 2011 at the World Data Center for Geoinformatics and Sustainable Development (WDC-Ukraine) - press service of NTUU "KPI". Among the delegates - Torbjørn Skogsrød (Dean, Faculty of Technology, Economy and Management at University College, Gjøvik) and his colleagues - Professor Christian Martinsen and Adne Middleton. The purpose of their visit is acquaintance with the activity of NTU «KPI» in the field of sustainable development and joint project. 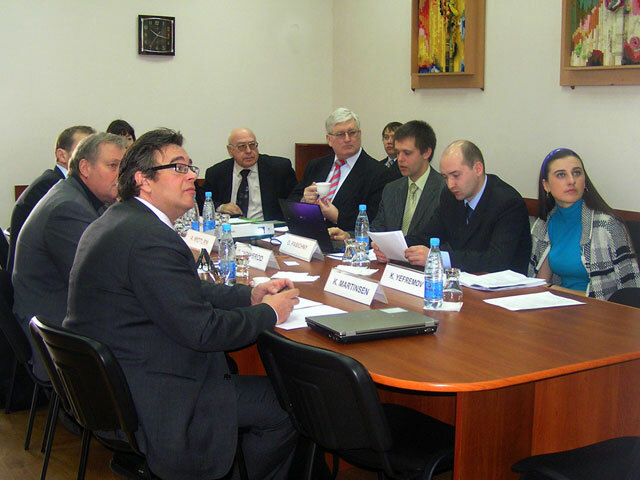 Project would be funded by the Norwegian fund the development of higher education according to the cooperation program "Eurasia" and it will consist of a course of lectures on "Sustainable Production". O. Pasichny (Deputy Director of WDC-Ukraine) and G. Statyukha (Head of subdepartment of Cybernetics of chemical and engineering processes of the Chemical Engineering Department, director of educational program CEEISD) acquainted guests with the Center's activity, methods of data analysis for countries’ sustainable development, as well as with training programs, courses and projects which are conducted at NTUU “KPI” and connected with sustainable development. Guests gave a presentation of their university and methods of implementing sustainable development and production concepts into educational programs. They’ve also spoke about preparation of bachelors and masters in these areas. The result of the meeting is a preliminary agreement on academic exchange of students, implementation of joint educational courses and further cooperation.